What: Learn a new and creative approach in the kitchen with this hands on creative kitchen event! A $100 fee includes $50 worth of food, a variety of seasonal recipes, and 20 portions to take home. Why: To support YorkArts and their Get Creative York initiative, showing that art comes in many forms. How: All attendees are required to preregister by contacting Abbi Ferree at 717-891-7004 or aferree1985@gmail.com. Spaces must be reserved and fees paid by April 25. Check back for more details on our annual fundraiser. On Tuesday, April 14th, Creative York will be hosting two 30min guided tours through Mr. Tim Grumbacher’s impressive art collection on display at the Bon Ton Corporate Center, 2801 E Market St, in York. The first tour will begin at 12:00pm, and the second at 12:45pm. Reservations are made on a first-come-first-serve basis and attendance is limited so email gallerydirector@yorkart.org or call 717-848-3200 to sign up today! We just passed $1 Million! Help us reach our goal! Because of the many generous people and businesses who have already contributed to our campaign, we are pleased to announce we have surpassed the million dollar mark! We are so grateful! To cross the finish line, we need your help. March is the last month of this campaign. We are $785,000 away from reaching our stretch goal of $1.8 million. You are the backbone of our organization because you make all of our work possible. Your gift to the capital campaign is extremely important to the York community, as it will fuel the creative well-being of your community well into the future. You have until the end of March to help us make this campaign a success. Please consider making as generous a gift as you can. Thank you! 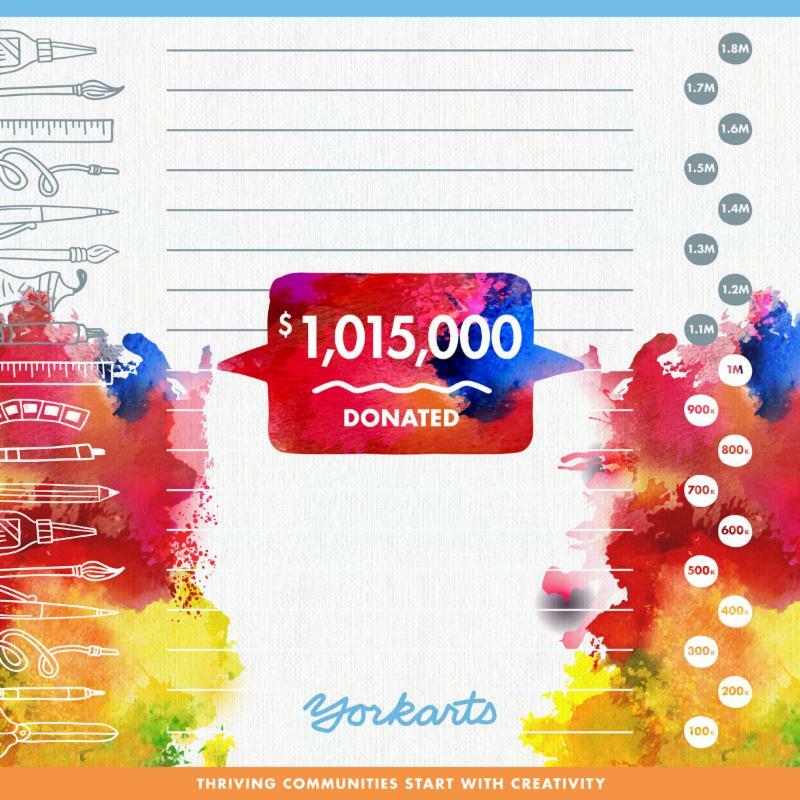 Visit our Donate Now page to donate online, or check out Ways to Give for other ways to support creativity. Every Spring, YorkArts puts together an exhibit celebrating “the Art Collector”, an exhibition series which we call Collecting Cultural Icons. This year we are dividing the Collecting Cultural Icons series into two parts, (compared to the usual one), to broaden the concept of what it means to collect art. New testimonials will be added every Tuesday throughout our Capital Campaign. We are pleased to announce steady progress in our capital campaign to $1.8 million! We begin the month of February with $957,500 raised from the generous and inspired people of York County (and beyond!). If you believe nurturing and developing creativity in children and adults is critical, consider joining in this important effort that will allow us to expand our capacity to reach more children and adults with better equipment and facilities. Visit our Donate Now page to donate online, or check out Ways to Give for other ways to give your gift. Thank you! If you have questions related to the campaign, do not hesitate to call Kevin Lenkner, executive director, or Laura Abbott, capital campaign assistant, at 717-848-3200. If you or a group you’re affiliated with is interested in raising money on our behalf to benefit our campaign, we gladly accept your graciousness and look forward to speaking with you about ways to work together.